On Sunday, The Reader Organisation, in partnership with the British Library and Vintage Classics, brought Liverpool’s famous Penny Readings to London for the very first time. What an afternoon it was! We celebrated both Dickens’ bicentenary, and the expansion of our Get Into Reading groups across the capital, with a truly magical line-up of readers, comedy, and music which had the audiences in stitches one minute, and tearful the next. The British Library provided a suitably literary venue and Vintage gave everyone a free Dickens novel to take home with them. No wonder the public tickets sold out in a day! 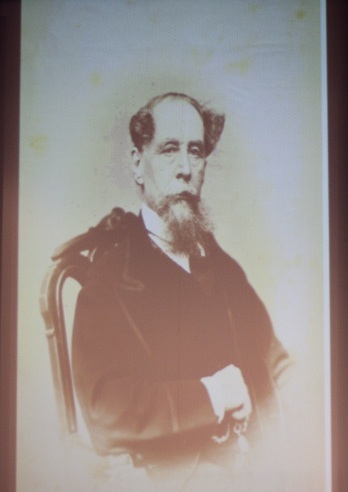 Whilst a portrait of the great man himself looked down on us, his actual DNA appeared on stage in the form of Lucinda Dickens Hawksley, his great-great-great granddaughter, who apologised for reading A Tale of Two Cities from a well-loved paperback rather than a precious family heirloom. This made no difference to the quality of her performance, however; all of our readers left the audience in spellbound silence. The wonderful AS Byatt read the opening to Great Expectations, reminiscing about the effect it had on her as a child and delivering Magwitch’s threats with relish. It might be January, but our own Phil Davis’ portrayal of the loving Cratchitt family in A Christmas Carol still kindled a warm and fuzzy feeling, whilst Angela Macmillan movingly recreated Peggotty’s loyalty and devotion to the young David Copperfield, leaving one audience member ‘weeping like a burst water pipe’. It was by no means all so emotional, though, largely thanks to our exuberanthosts. 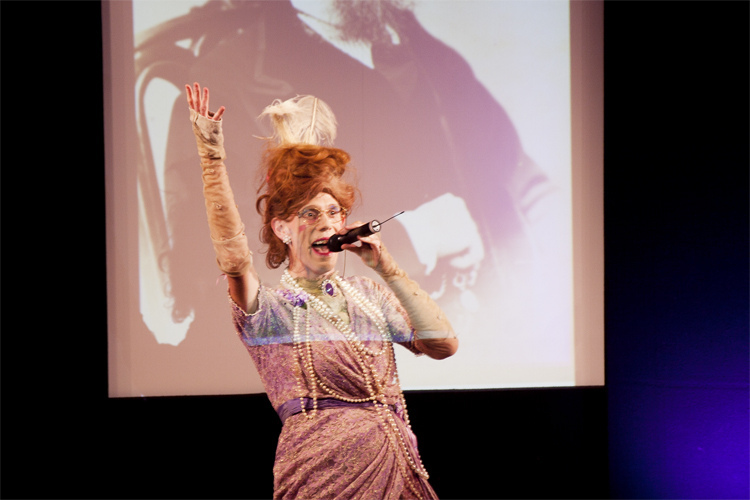 Christopher Green, an experimental artist, was a witty compere for thefirst half, but we were truly honoured to be joined by Ida Barr, a highly distinguished musical hall singer turned R’n’B rap superstar, for the second. Funnily enough, she did bear a passing resemblance to her predecessor…Still, her mash-up of ‘If I were the only girl in the world’ with Rhianna’s ‘Only Girl(In the World) brought the house down. Louis de Bernierès was faced with the almost impossible job of following that with the death of Little Nell from The Old Curiosity Shop, a scene that Oscar Wilde declared only someone with a heart of stone could read without laughing. Nevertheless, Louis rose to the task and left us all, in Ida’s words, ‘post traumatic stress disordered’. 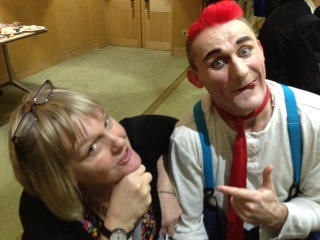 antics with the glamorous Romany, Diva of Magic, who plucked him from the audience to assist her in the ‘tunnel of love’. Meanwhile, Tweedy the Clown’s escapades with his hat and precarious activities on a ladder had us alternating between chuckles and gasps. The afternoon was rounded off by the beautiful voice of mezzo-soprano Patricia Hammond, who had everyone singing along to old favourites such as ‘We’ll Meet Again’. Dickens himself was a consummate entertainer and would surely have approved of the eclectic line-up, a perfect mix of comedy and pathos, just like the novels we were there to celebrate. A big thank you to everyone who was involved and made it such a special event. If you came along, we’d love to hear your thoughts so please leave a comment below. Don’t worry if you didn’t make it this time around – we will be back in Liverpool as usual in December and fingers crossed our London escapades will be the first of many! Truly unforgettable! It’s not every Sunday afternoon you get to experience the whole range of emotions. Exceptional readings from Phil and Angie.